Michel de Broin, Smoke, 2011, color, video, sound, 2 minutes, 50 seconds. Michel de Broin’s US solo debut activates cracked lightbulbs, wood logs, bronze castings, and a bicycle with electric currents. The Montreal-based artist calls upon these basic objects to convey fundamental physical forces, all the while adding a trace of whimsy to his works. The result is a constituency of protean ingenuity. A superlative example is Overpower, 2013: A ten-thousand-volt current blazes through a bronze warrior figure that wields a sword over a broken lightbulb. Charged by the voltage, the sword ignites the bulb’s filament, resulting in an electric flash that rushes between the two objects. The smartly titled sculpture Logged On, 2013, demonstrates the incongruity of de Broin’s practice. A steel girder stands erect on the floor, as a shorter log clings to its side. This strange embrace is maintained by an electrical current fed through a coil inserted into the log, magnetizing it to the steel beam. There is an underlying temporality in this fragile partnership’s reliance on an uninterrupted flow of power: The man-made beam, so much larger than the log, privileges the human product over the human. Elsewhere, a video titled Smoke, 2010, shows a bike being ridden through a cemetery, leaving trails of smoke behind it. 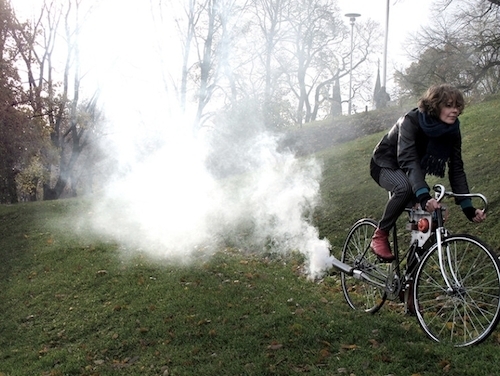 De Broin creates this effect by converting the rider’s energy into an electrical current, which activates a smoke machine. As the ghostly fog dissipates it evokes terrestrial impermanence, a note echoed in the headstones through which it drifts. In the gallery, the bike itself rests against a column, affording an inspection of its mechanics. Both of these works require finite energy sources to run transformative systems—if the metaphysical is at play here, the sheer brevity of what is temporal (us) has been brought fully into focus.